Gunni is still waiting for a match-up for 24 October. AFTER HIS MOST recent win, it’s no surprise that the UFC are having a difficult time finding someone to fight Gunnar Nelson at UFC Dublin on 24 October. Nelson, who submitted Brandon Thatch in the first round of their bout at UFC 189 last month, is a big draw among the UFC’s Irish fanbase due to his connections to Dublin’s Straight Blast Gym. In his exclusive column here on The42, SBG head coach John Kavanagh mentioned yesterday that the Icelandic welterweight was still waiting to be matched up for UFC Fight Night 76. “A couple of welterweights have been offered that fight, but apparently they had a baptism or a haircut scheduled for that day so unfortunately it couldn’t happen. However, we’re hoping to get something finalised for him very soon,” said Kavanagh. According to UFC Tonight, among the fighters who were offered the fight with Nelson at the 3Arena are Demian Maia and Stephen ‘Wonderboy’ Thompson — who are ranked sixth and ninth respectively in the 170lbs division. Maia, who defeated Neil Magny earlier this month at UFC 190, says he’s unavailable due to a staph infection on his left leg. An injury carried over from his defeat of Jake Ellenberger last month, meanwhile, rules Thompson out of a meeting with Ireland’s favourite Icelander this autumn, so the search for an opponent for Nelson goes on. 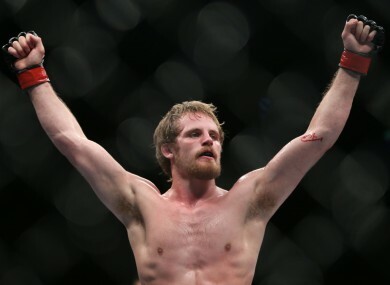 Email “Two big-name fighters had to turn down a UFC Dublin bout with Gunnar Nelson”. Feedback on “Two big-name fighters had to turn down a UFC Dublin bout with Gunnar Nelson”.